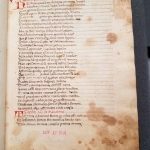 Since last fall, Connelly has been part of The Stains Project, also known as Labeculae Vivae (Stains Alive), together with colleagues Alberto Campagnolo (CLIR fellow, Library of Congress) and Heather Wacha (CLIR fellow, University of Wisconsin – Madison). 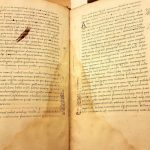 The project focuses on “dirty” old books and the stains found in them, using them as a tool for gathering scientific data that will provide clues to how previous generations used and stored their reading material. 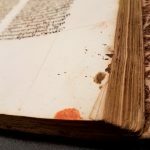 This project examines a variety of stains found on parchment, paper, and bindings from medieval manuscripts, in some cases using multispectral imaging to yield even more information. Wax drips, Free Library of Philadelphia LC 14 13. 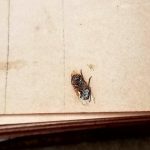 Insect, Free Library of Philadelphia, Lewis E 238, fol. 64V. 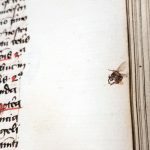 Insect, Free Library of Philadelphia, Lewis E 43. 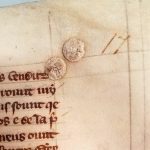 Fingerprint, Free Library of Philadelphia, LC 14 10, f. 6. 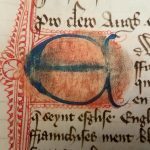 The Library of Stains has been funded by a Postdoctoral Fellowship micro-grant from the Council on Library and Information Resources (CLIR), whose generous funding has also made BiblioPhilly possible. 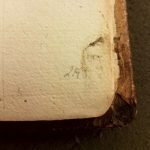 Both the Library of Stains and BiblioPhilly are made possible by funding from The Andrew W. Mellon Foundation.